During 1987, just prior to the collapse of the 300ft mast, plans were in place to install a second 50kW transmitter - but for this to happen additional power generation would be needed to accomodate the increased load. 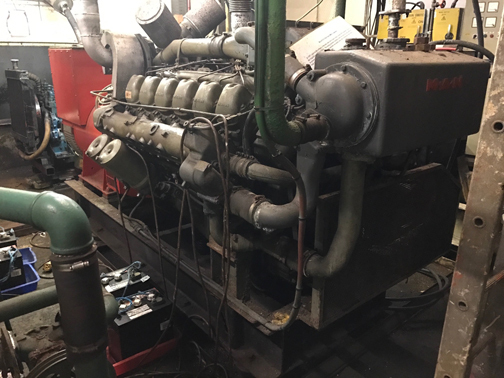 In prepartion for the proposed transmitter upgrade a V12 500kVA MAN generator set was shipped out to the Ross Revenge for installation by the crew. Given the size of this set it had to be craned onboard and broken down in order to be lowered through the deck hatch into the generator room - and then reassembled in between the two live generators .... all whilst at sea battling with the elements. With the iconic mast now gone there was no longer a requirement for this generator and at best it was only run a few hundred hours. In years to follow bearing problems forced the 500kVA MAN set into retirement. With a lot of work carried out this generator could be brought back into action, but with a fuel consumption of some 50 litres/hour (10 gallons) it is highly unlikely that this will ever happen.